Description: "Since the end of the last century," Walter Benjamin wrote, "philosophy has made a series of attempts to lay hold of the 'true' experience as opposed to the kind that manifests itself in the standardized, denatured life of the civilized masses. It is customary to classify these efforts under the heading of a philosophy of life. Towering above this literature is Henri Bergson's early monumental work, Matter and Memory. "Along with Husserl's Ideas and Heidegger's Being and Time, Bergson's work represents one of the great twentieth-century investigations into perception and memory, movement and time, matter and mind. 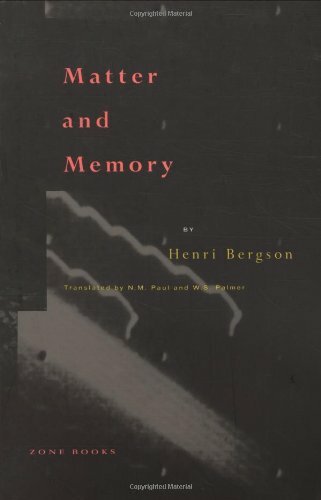 Arguably Bergson's most significant book, Matter and Memory is essential to an understanding of his philosophy and its legacy.This new edition includes an annotated bibliography prepared by Bruno Paradis.Henri Bergson (1859-1941) was awarded the Nobel Prize in 1927. His works include Time and Free Will, An Introduction to Metaphysics, Creative Evolution, and The Creative Mind.